Corey Lewandowski out as Trump campaign manager. 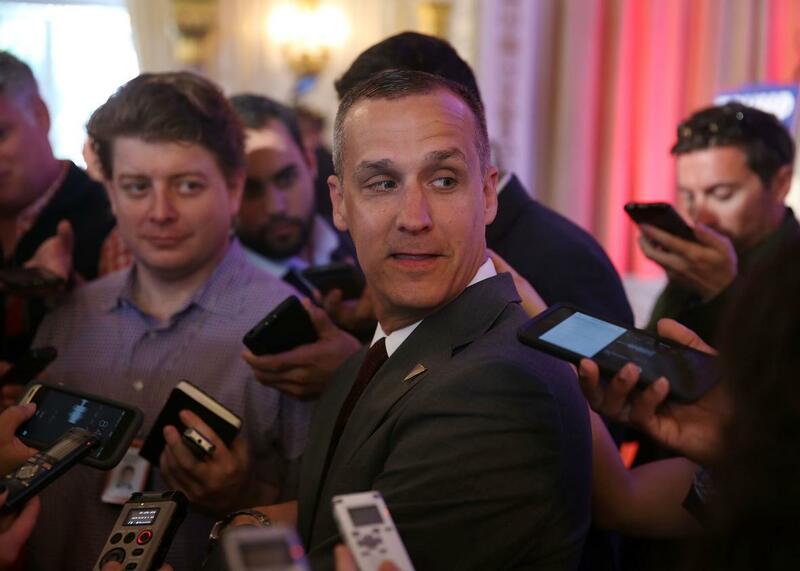 Corey Lewandowski speaks with the media on March 11 in Palm Beach, Florida. Update: It appears as though Corey Lewandowski will continue to play the part of loyal foot soldier—at least publicly—even after being unexpectedly fired by Donald Trump on Monday. “I had a nice conversation with Mr. Trump and said to him, it’s been an honor and privilege to be part of this and I mean that from the bottom of my heart,” the ousted campaign manager said during a lengthy CNN interview. Immediately after Lewandowski was canned on Monday morning, much of the Beltway was speculating about whether a man with his well-known temper might burn Trump Tower down on his way out the door. But his first public comments suggest that he’s going to stay on message. He repeatedly passed up the opportunity to take parting shots at his former colleagues and Trump’s adult children, who reportedly had a direct hand in deciding his fate. (The only exception was when Lewandowski was confronted by a gloating tweet from Michael Caputo, Trump’s New York state director, but even then Lewandowski largely shrugged it off.) Instead, time and again, he pivoted to praising Trump and what he accomplished during the GOP primary. At one point Lewandowski even described his former boss as “probably the best speaker our country has ever seen as presidential candidate,” and at another he said he didn’t have a single regret from his time with the campaign. In short, he sounded like a man interviewing for a job, which makes sense given he more or less is, now that he’s been fired from his last one. Still, what Lewandowski says on camera could very well be different than what he says off the record. He and Paul Manafort waged a shadow war for control over the campaign earlier this year, and it’s not hard to imagine Lewandowski looking for payback now that it’s clear he lost. Even so, any leaks that come from him appear more likely to be aimed at campaign staff than at the candidate. Update, 12:37 p.m.: Additional details continue to trickle in following Corey Lewandowski’s surprise departure from the Trump campaign on Monday, the juiciest of which is this: Trump’s adult children are said to have had a direct hand in Lewandowski’s ouster. New York magazine described the firing as “the result of a coup led by Trump’s children Ivanka, Eric, and Donald Jr.” The Washington Post’s sources tell a similar story, though they stopped short of describing the children-led push as a full-on coup. Trump, in the paper’s words, was “encouraged” to part ways with his controversial campaign manager by Ivanka, Eric, Donald Jr., and Ivanka’s husband, Jared Kushner, along with a “chorus of allies and other supporters.” Notably, Lewandowski himself appears to be pushing the narrative that it was Trump’s children who decided his fate. “What he is saying to operatives is that the critical mass was finally reached with Trump’s kids,” an unnamed source told the Post. Lewandowski’s departure leaves Paul Manafort as the de facto head of the Trump campaign. Manafort is a well-connected GOP operative, which will allow Team Trump to spin the campaign shakeup as evidence of its long promised but never delivered general election “pivot.” In order to believe that, though, you have to believe that Trump has an actual strategy beyond simply doing and saying whatever offensive thing comes to his mind at any particular moment. Original post, 10:17 a.m.: Donald Trump is parting ways with his controversial—and (literally) combative—campaign manager, Corey Lewandowski. Lewandowski was a relatively minor player in the world of politics before signing on to steer the celebrity businessman’s campaign last year. He saw his national profile rise, though, as Trump went from a late-night punch line to a late-night punch line who was also the presumptive GOP nominee. Lewandowski was a visible presence on the trail, where he was often by his boss’ side, and found himself in the headlines—and the police blotter—when he laid his hands on a female journalist at a campaign event in March. More recently, he was said to be in an internal power struggle with Paul Manafort, the GOP operative who has made a fortune for himself rehabbing the images of some of the world’s nastiest tyrants. That’s a battle it appears that Lewandowski has now lost. News of the campaign shake-up comes as Trump struggles amid plunging poll numbers and the re-emergence of a Stop Trump movement, this time one led by a group of national delegates that are hoping to rewrite convention rules to deny him the party’s nomination.